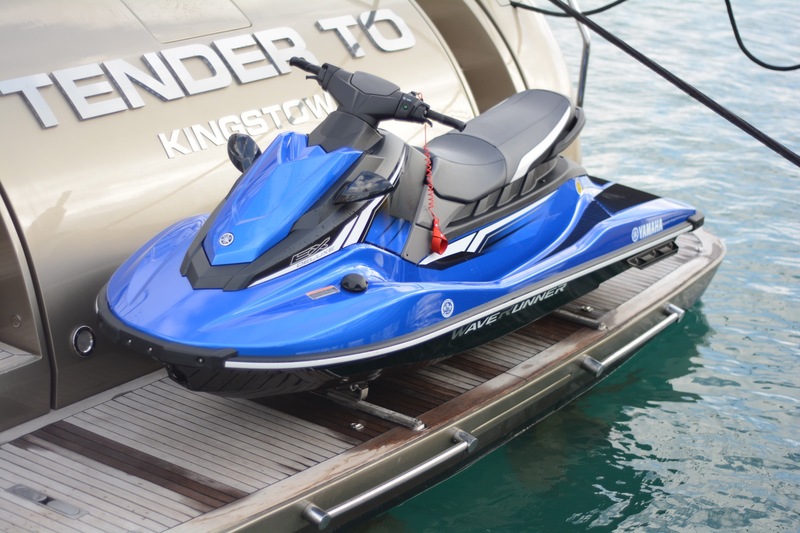 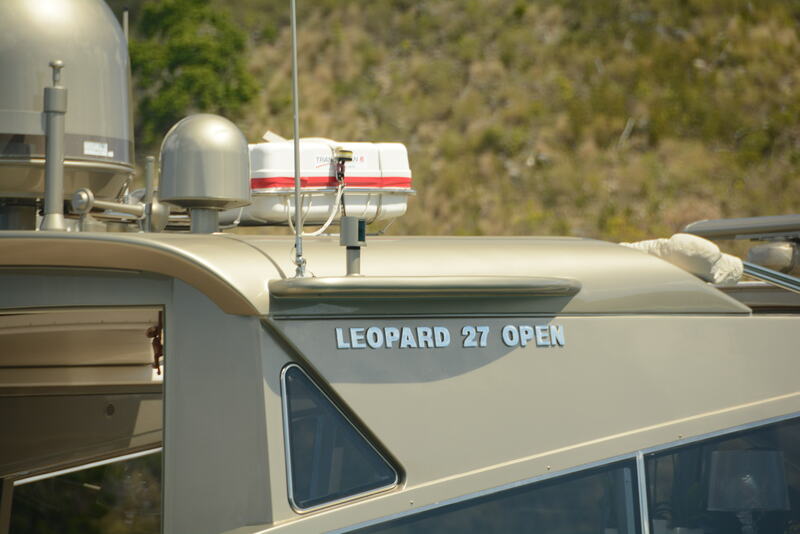 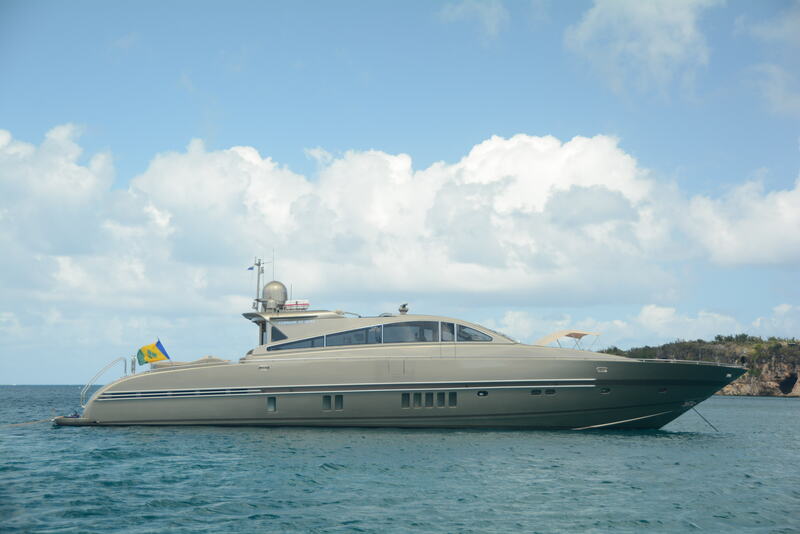 The Leopard (Arno) motor yacht TENDER TO was delivered in 2005 and refitted in 2015. 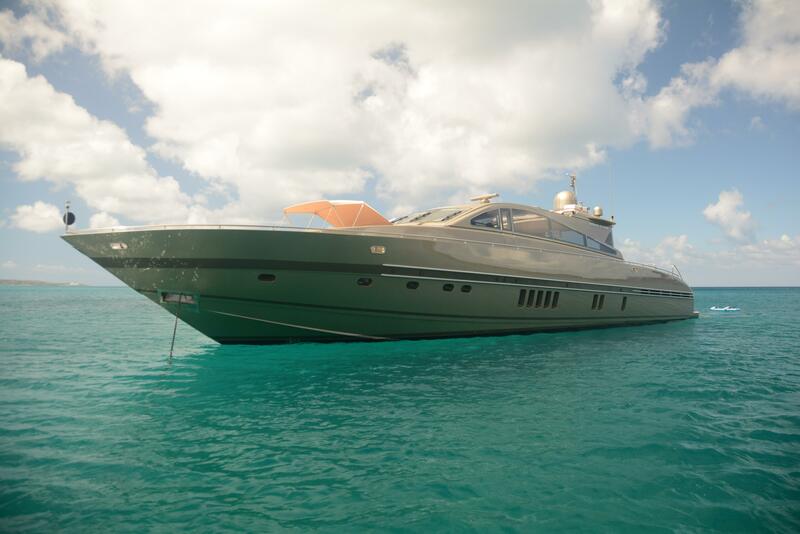 At 27m (88’7’’) she features a unique and stunning metallic paint job on her exteriors, while her interiors are contemporary and inviting, making her a great choice for luxury charters. 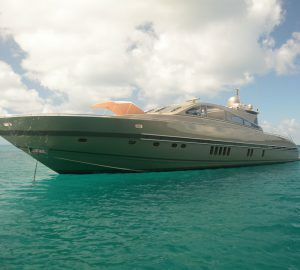 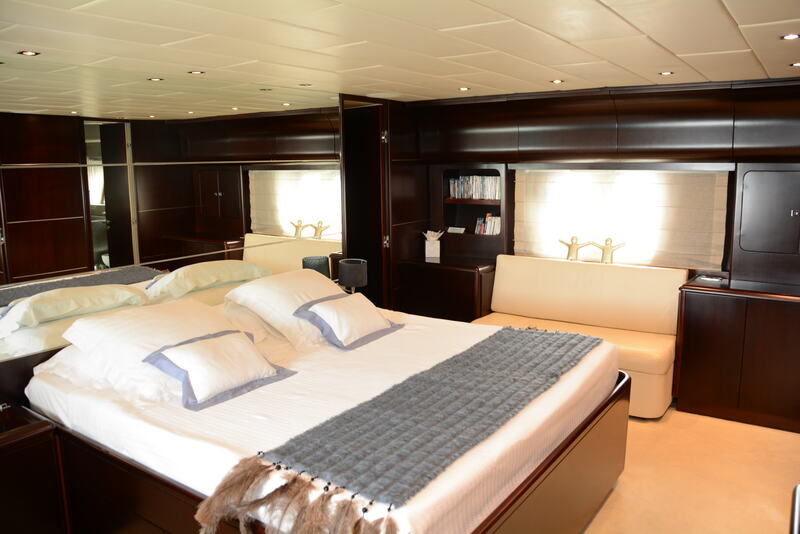 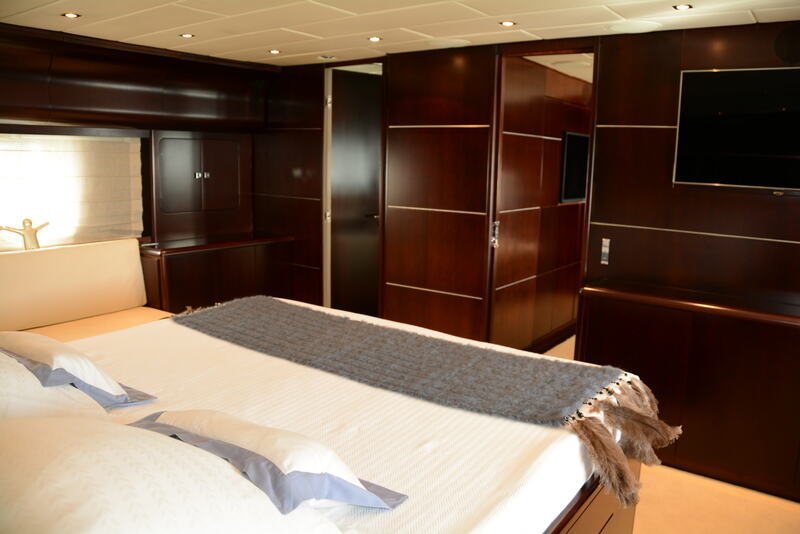 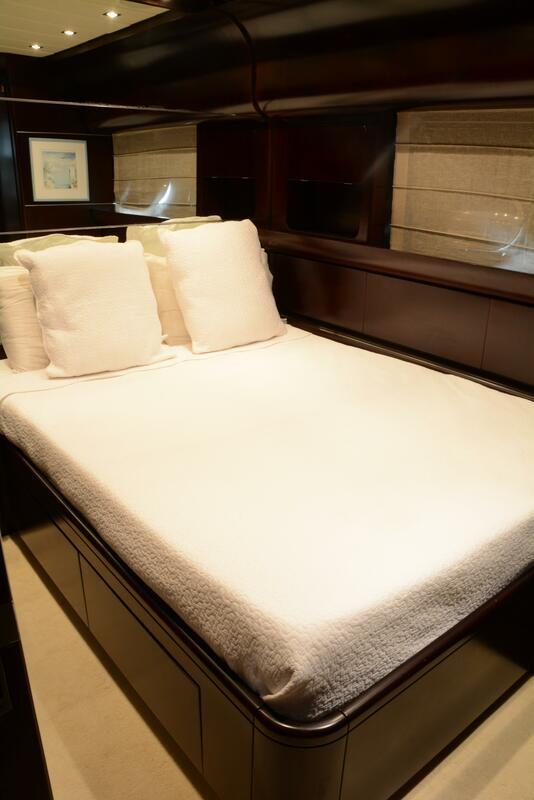 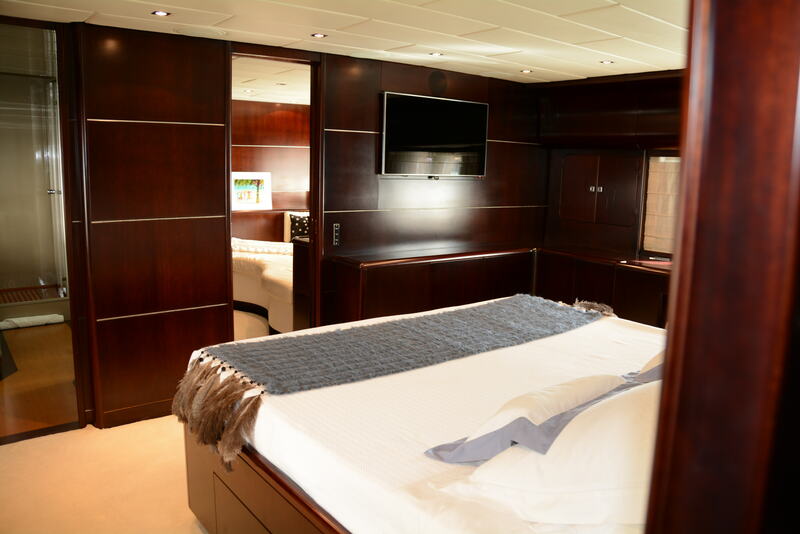 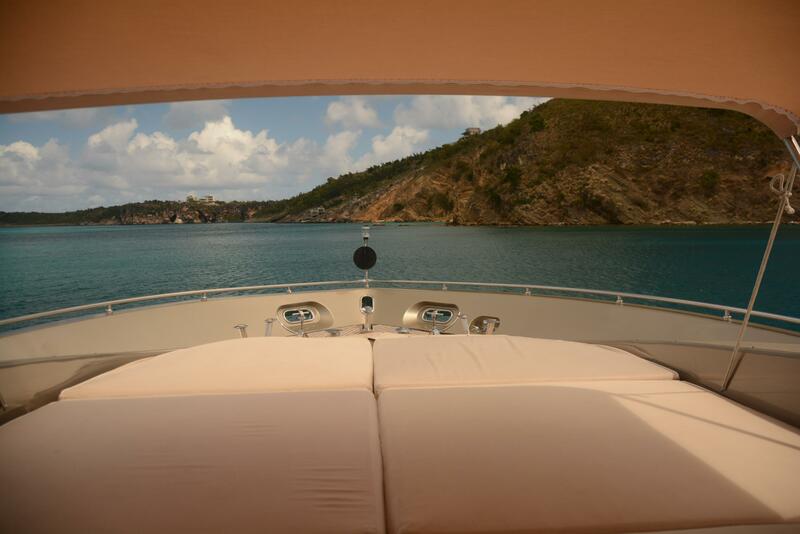 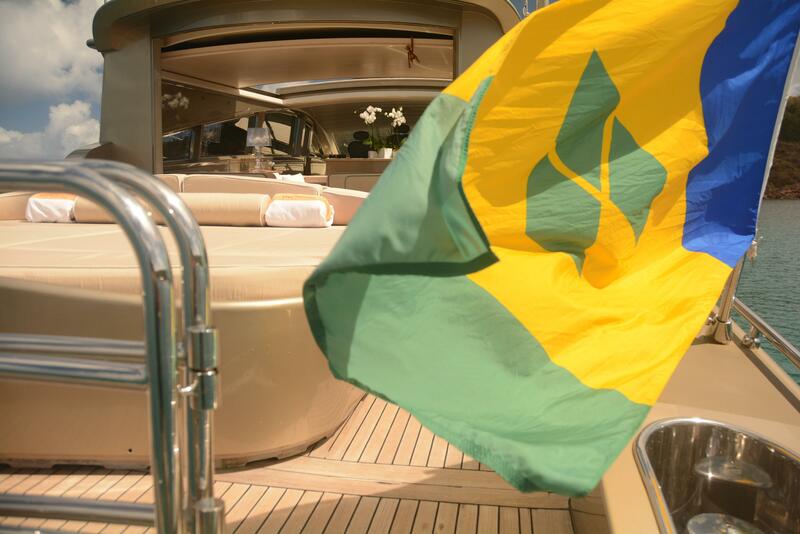 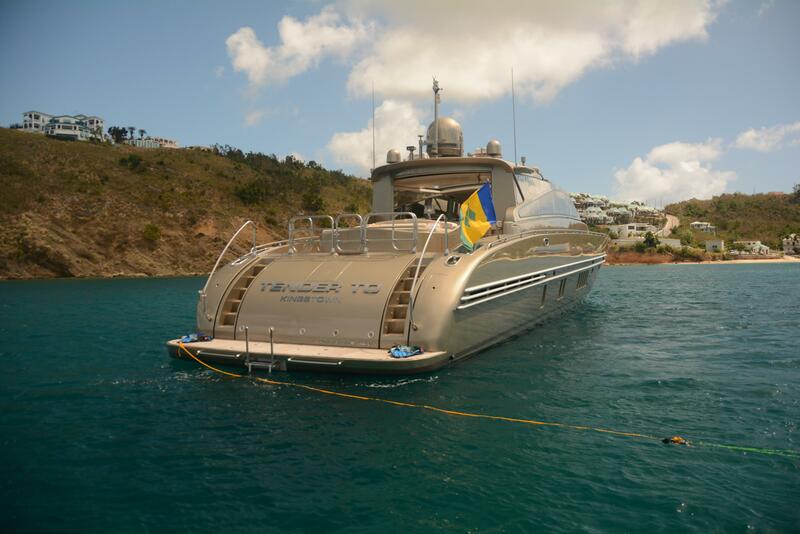 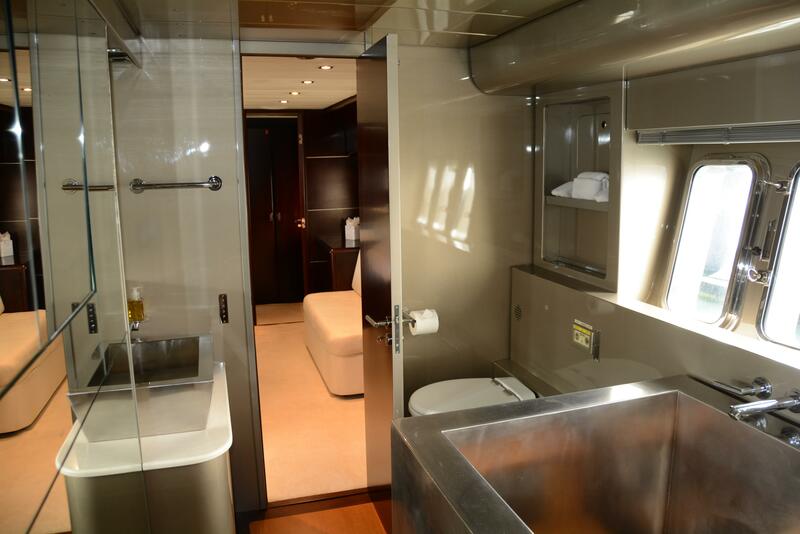 The yacht accommodates 7 guests, with 3 ensuite cabins. 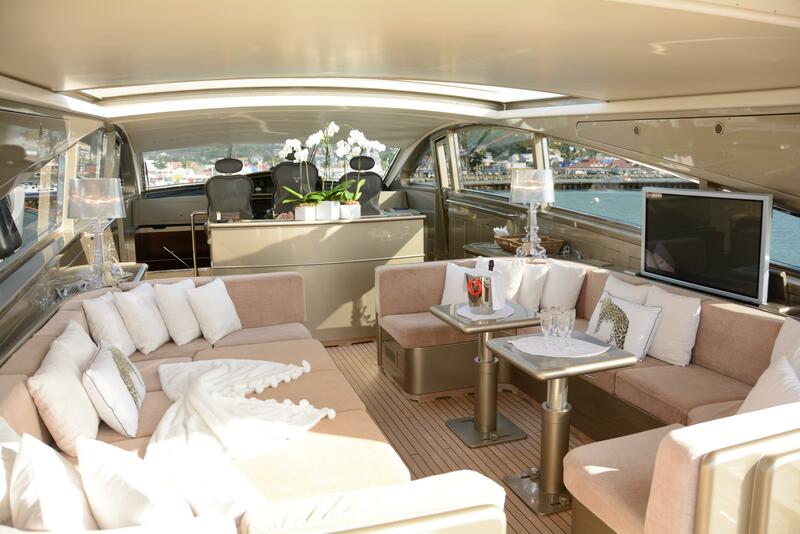 The open plan salon is located on the main deck with opposing port and starboard tables, each of which can easily become full dining tables. 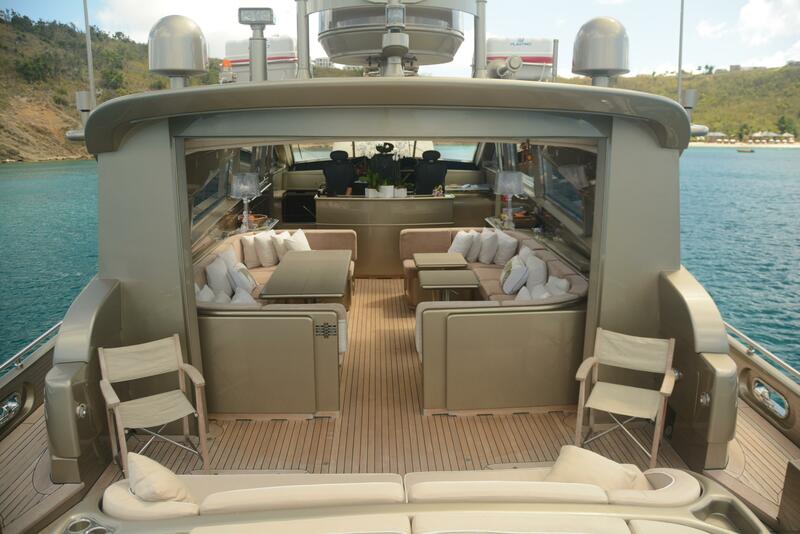 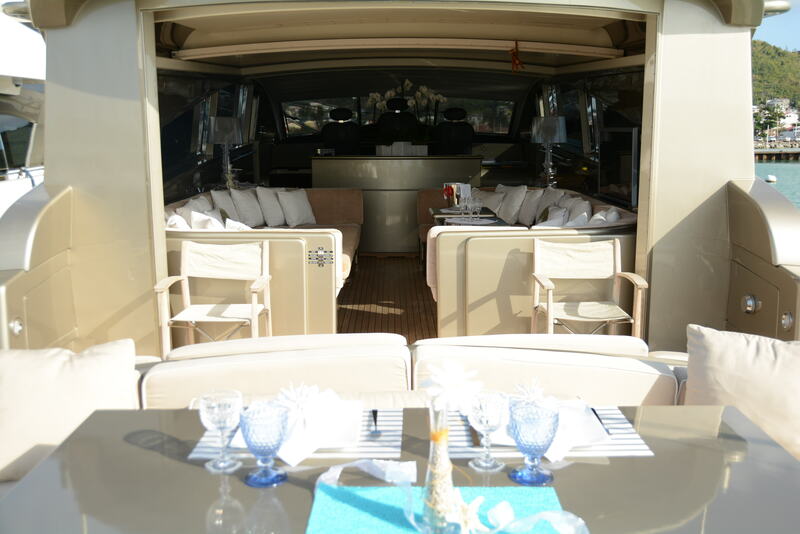 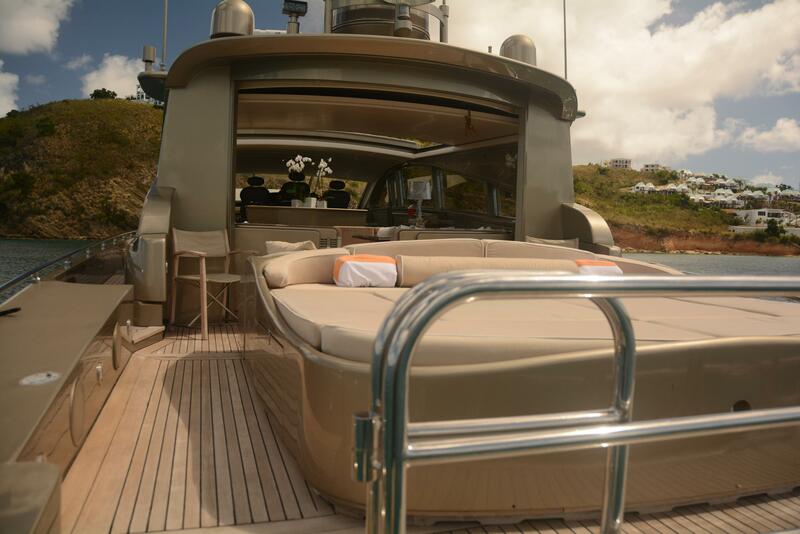 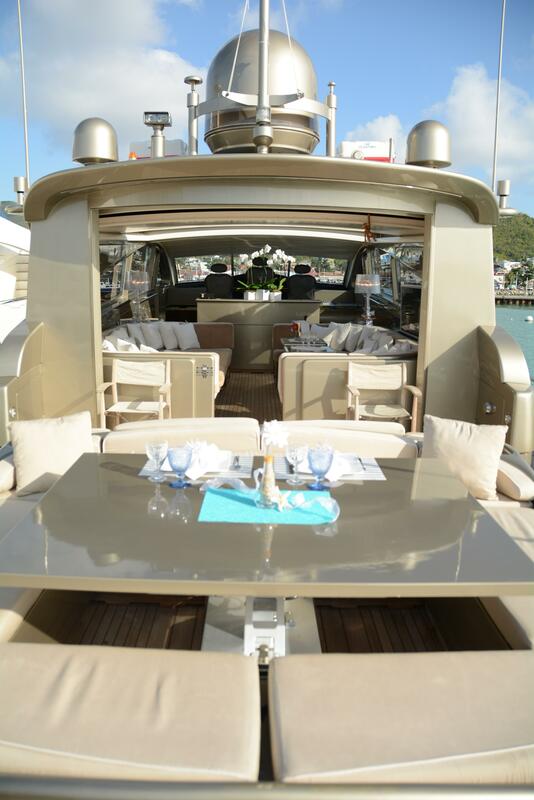 The starboard side converts into cocktail tables, whilst the port side into a large day bed, making the layout exceptionally versatile. 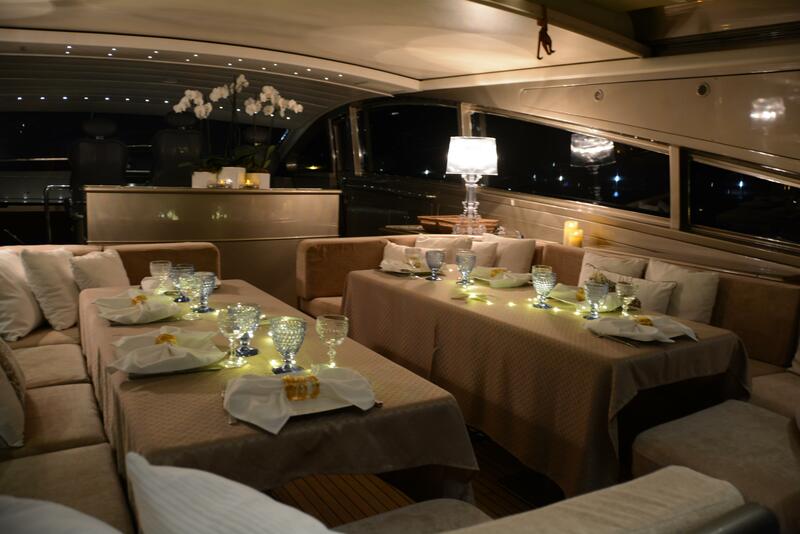 An overhead retractable roof allows for plenty of natural light, warm breezes, or an elegant starlit dinner. 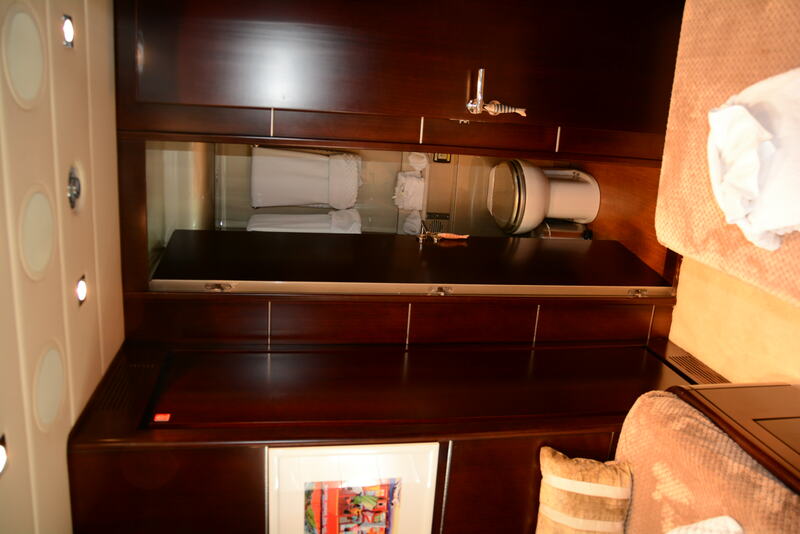 A drop-down TV provides entertainment if requested. 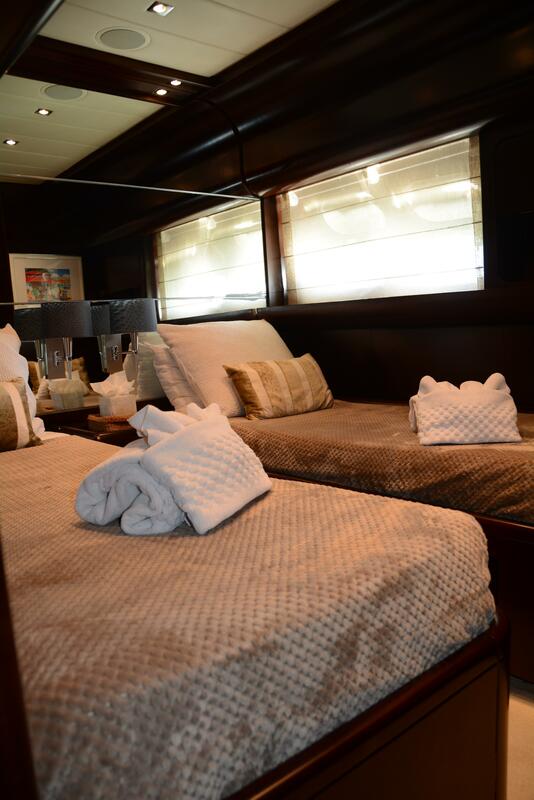 Below decks are 3 guest cabins, each with their own ensuite, plus a TV room that connects to the master, or can be separated. 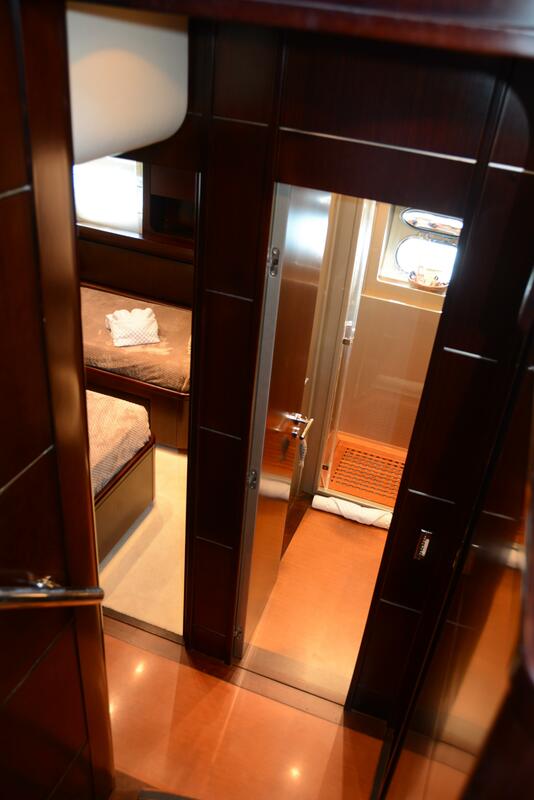 Her exterior space naturally flows from the upper salon, which is ideal for socializing. 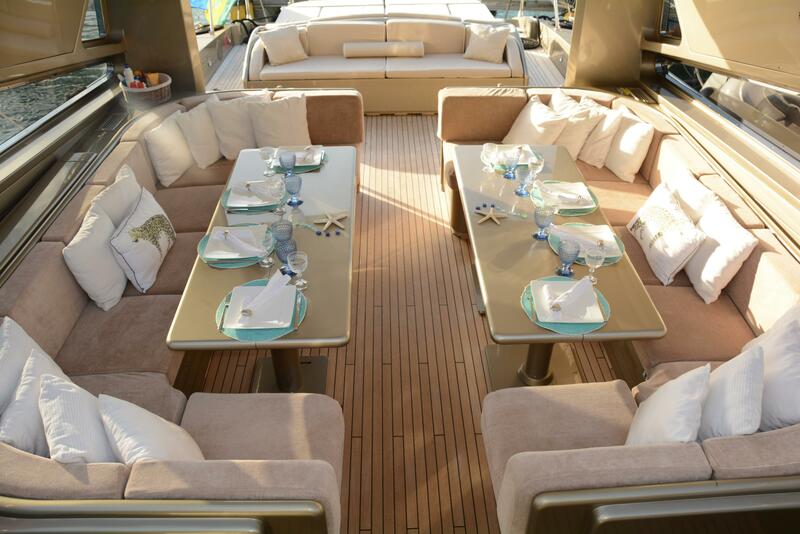 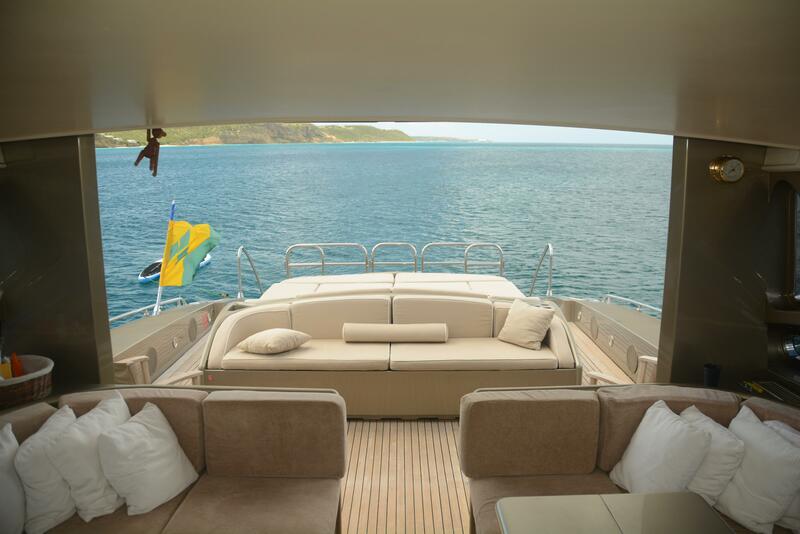 The aft deck offers a large sunbed and seating area, which easily transforms into an alfresco dining table. 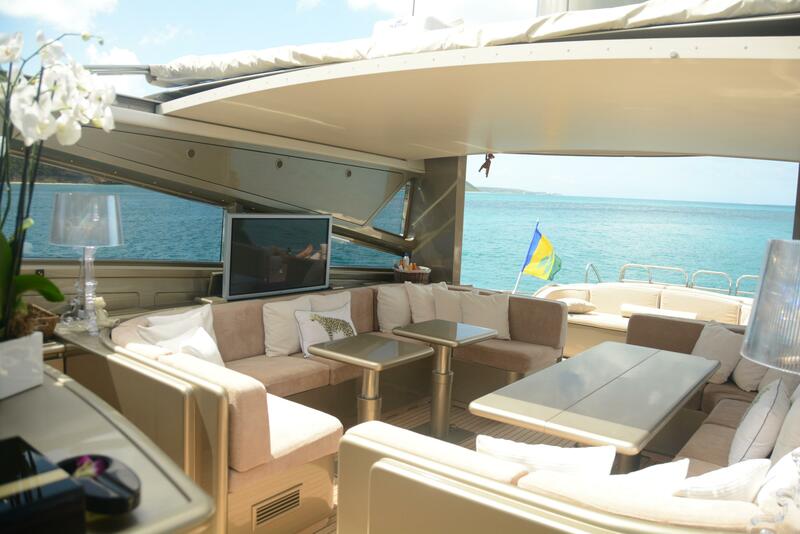 Dual transom steps lead to the swim platform, where guests can effortlessly enjoy the vast assortment of water toys on offer. 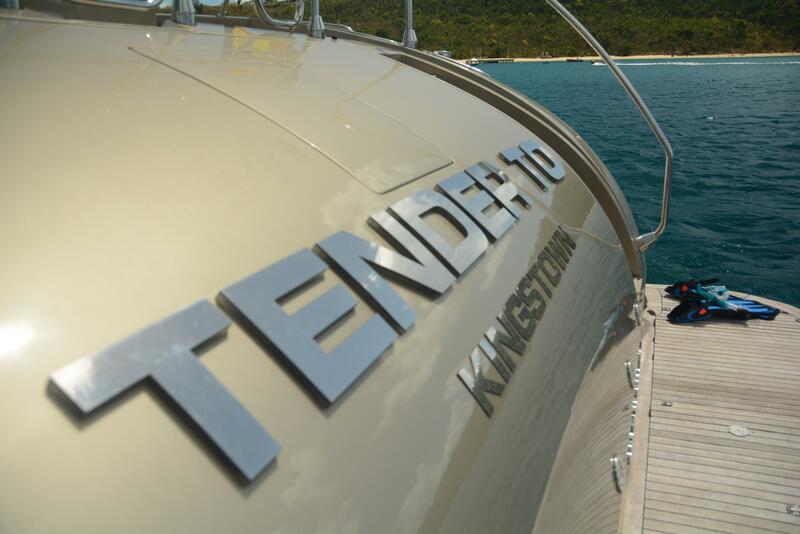 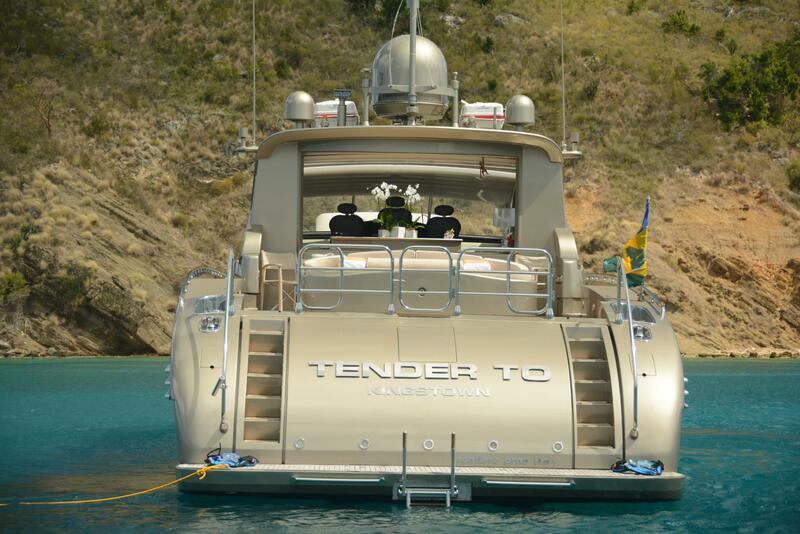 TENDER TO’s foredeck has a fabulous sun pad for that quiet escape, soak up the sun or pull over the optional Bimini for shade and privacy. 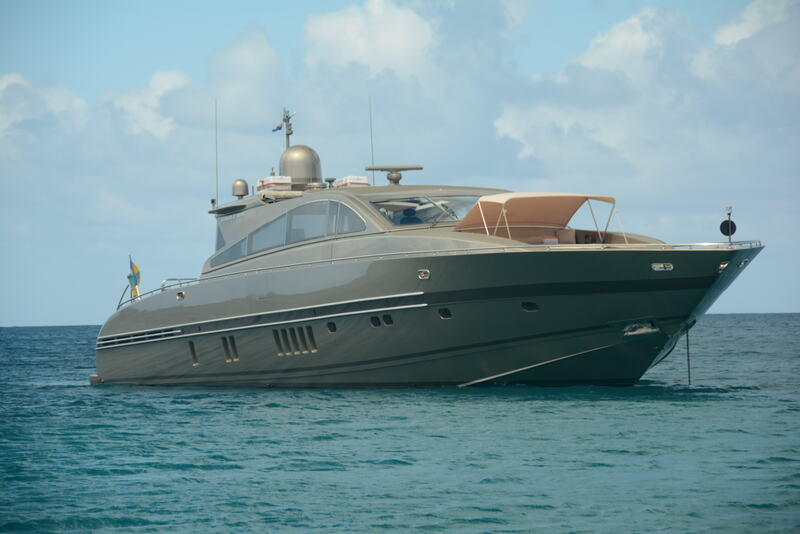 Powered by twin MTU 2000hp engines, the Leopard (Arno) yacht cruises at 28 knots and reaches exhilarating speeds of up to 38 knots. 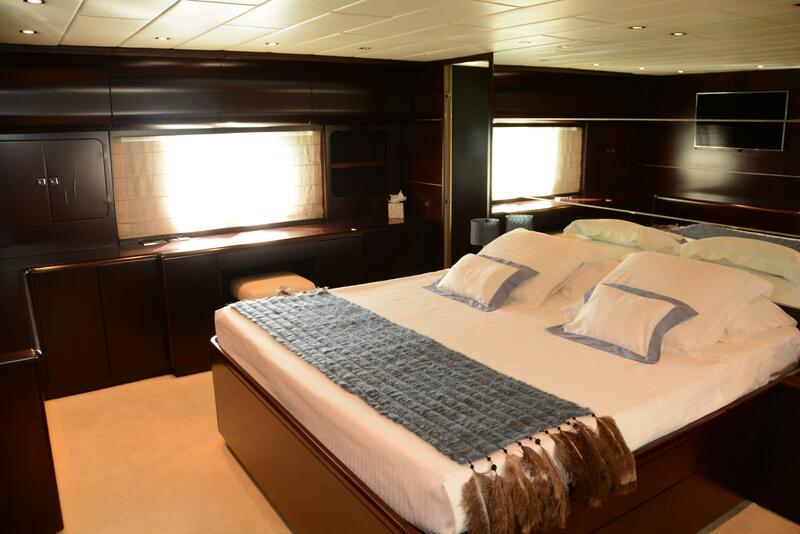 Accommodation is offered in one full beam master stateroom, complete with a king size bed, vanity, sofa, walk-in wardrobe and a generous bathroom, offering a shower and a tub. 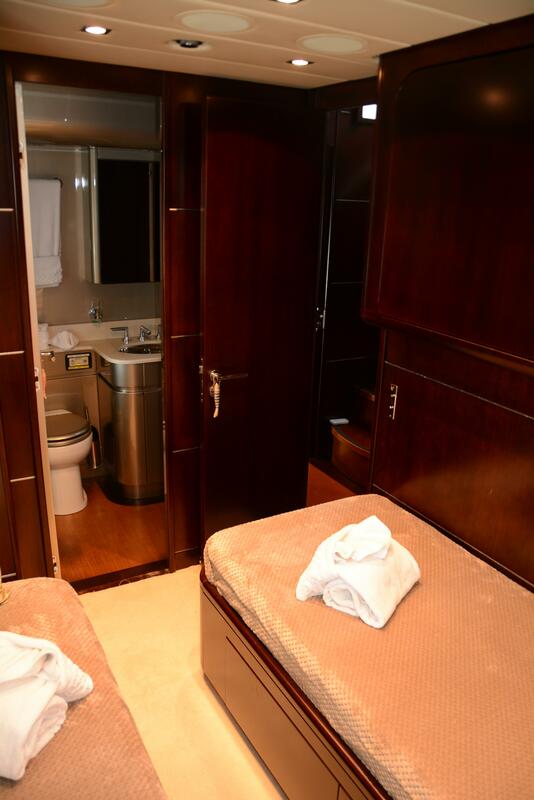 A double cabin has a double bed, and a further twin cabin comprises 2 single beds and a Pullman. 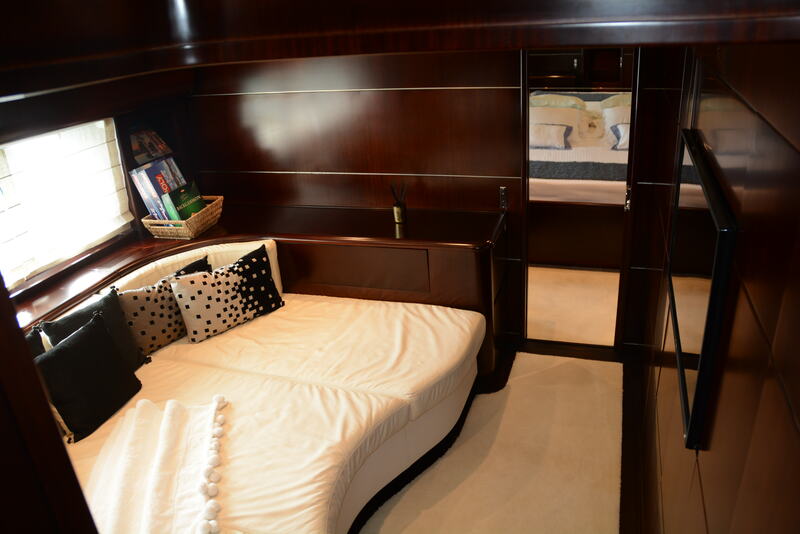 An additional TV room can be converted into a double sleeping space.